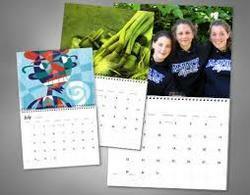 We are fruitfully catering to the assorted demands of the customers by providing Custom Printed Calendar. Being a customer oriented organization, we are deeply engaged in offering a wide array of Hindu God Calendar. Catering to the varied needs of our clients, we offer services for a wide range of Calendar, Promotional Calendars and Photo Calendars for various companies. To offer high quality services we use different techniques like embossing and printing styles. Moreover, we also offer customization to our range. Make every day count with your custom calendar. Add your own special photographs, images, and text for each month of this two-page calendar. Start your design from scratch or customize your choice of unique templates. Owing to our in-depth knowledge of this domain, we are specialized in providing Customized Table Calendar. Customized to customer required. Offset Printing, Spot UV Coating, Varish, Drip Effect, Gloss & Matt Lamination, Embossing etc. Duplex Board Grey & White back, ITC White board etc. Packaging: Calendar Size: Width 8.5 x Height 7.5 inches. • High quality four color front back printing with 250gsm Royal Art paper (Matt). Custom Printed Calendar Product obtainable are made by making use premium quality raw material and most up-to-date tools and technology. Products are passed through different quality checks that promise products quality in harmony with universal quality standards. Furthermore, these cards are available at most reasonable prices. We are one the prominent manufacturer of desktop diary provides to our clients at affordable prices. Matching to the requirements of customers, we are engaged in providing premium quality of Customized Calendar. 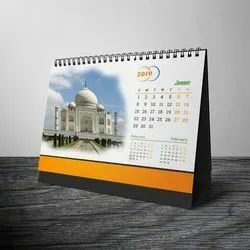 This Customized Calendar is available in market in various sizes and prints. The offered Customized Calendar is also customized as per the.